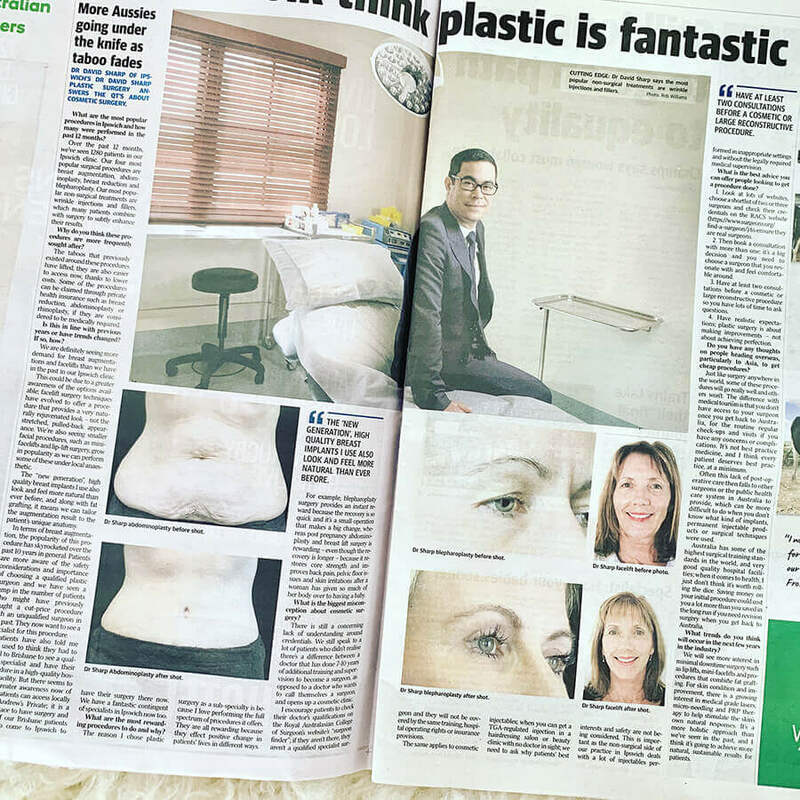 Dr Sharp was featured in the QT this month, discussing the tips, trends and pitfalls of plastic surgery in 2019. He said more Australians are undergoing plastic surgery as taboos fall and surgical advancements evolve. The reason I chose plastic surgery as a sub-specialty is because I love performing the full spectrum of procedures it offers. They are all rewarding because they effect positive change in patients’ lives in different ways. For example, blepharoplasty surgery provides an instant reward because the recovery is so quick and it’s a small operation that makes a big change, whereas post pregnancy abdominoplasty and breast lift surgery is rewarding – even though the recovery is longer – because it restores core strength and improves back pain, pelvic floor issues and skin irritations after a woman has given so much of her body over to having a baby. We will see more interest in minimal downtime surgery such as lip lifts, mini-facelifts and procedures that combine fat grafting. For skin condition and improvement, there is a growing interest in medical grade lasers, micro-needling and PRP therapy to help stimulate the skin’s own natural responses. It’s a more holistic approach than we’ve seen in the past, and I think it’s going to achieve more natural, sustainable results for patients. The interest in having cosmetic surgery is definitely still on the rise. This is because the taboos that previously existed around these procedures have lifted; they are also easier to access now, thanks to lower costs. Some of the procedures can also be claimed through private health insurance such as breast reduction, abdominoplasty or rhinoplasty, if they are considered to be medically required. We are definitely seeing more demand for breast augmentations and facelifts than we have in the past. This could be due to a greater awareness of the options available; facelift surgery techniques have evolved to offer a procedure that provides a very naturally rejuvenated look – not the stretched, pulled-back appearance. We’re also seeing smaller facial procedures, such as minifacelifts and lip-lift surgery, grow in popularity as we can perform some of these under local anaesthetic. The “new generation”, high quality breast implants I use also look and feel more natural than ever before, and along with fat grafting, it means we can tailor the augmentation result to the patient’s unique anatomy. In terms of breast augmentation, the popularity of this procedure has skyrocketed over the past 10 years in general. There is still a concerning lack of understanding around credentials. We still speak to a lot of patients who didn’t realise there’s a difference between a doctor that has done 7-10 years of additional training and supervision to become a surgeon, as opposed to a doctor who wants to call themselves a surgeon, and opens up a cosmetic clinic. I encourage patients to check their doctor’s qualifications on the Royal Australasian College of Surgeon’s website’s ‘surgeon finder’; if they aren’t there, they aren’t an accredited Specialist Plastic Surgeon. Meaning, they will not be covered by the same training, hospital operating rights or insurance provisions. The same applies to cosmetic injectables; when you can get a TGA-regulated injection in a hairdressing salon or beauty clinic with no medical professional in sight; we need to ask why patients’ best interests and safety are not being considered. 1. Look at lots of websites, choose a shortlist of two or three surgeons and check their credentials on the Royal Australasian College of Surgeons’ website (https://www.surgeons.org/ find-a-surgeon/) to ensure the surgeon you choose in in fact a Specialist Surgeon and accredited by the Australian Health Practitioners Regulation Agency. 2. Book a consultation with more than one; it’s a big decision and you need to choose a surgeon that you resonate with and feel comfortable around. 3. Have at least two consultations before your surgery to ensure you’ve had the time to ask all of your questions and that you fully understand the potential complications and how long your recovery is going to take.